A solar still can produce two pints of fresh water from sea water a day. Deflated it oppupies the space of a pint can of water. 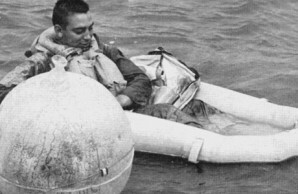 Some U. S. Navy planes carry this solar still model. In short, it is claimed that the survivor could live for eleven days on little more than one quart of fresh water, although this claim has not been subjected to experiment. Unfortunately, many of the stories written about the French experiments omit any mention of the restrictions on the use of sea water and leave the reader with the impression that the sea will provide all the water a man needs for an indefinite period. Why do the services take this stand? Is it due to the natural reluctance of medical men to accept a theory that has not been thoroughly tested? Or is it because the theory has been tested and found wanting? The fact is that the problem of providing water for the survivors of shipwreck and aircraft ditchings has been thoroughly investigated, and the investigators have found that the use of sea water is not the answer. 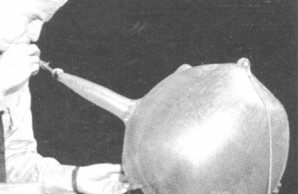 During World War II, the armed forces and the merchant marines of all the combatants were faced with the problem of providing seamen and airmen with a supply of water in case of disaster. This problem posed many questions, the first of which was: How much water does a man need in a survival situation? 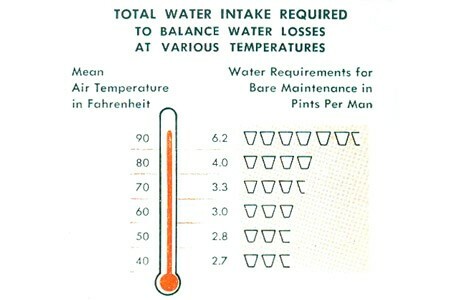 The standing rule of thumb used prior to World War II on board naval vessels and merchant ships was “a pint a day per man.” However, tests on subjects placed in a simulated survival situation soon showed that this was not enough to keep a man in water balance. Different investigators came up with different answers as to the exact amount of water needed to prevent dehydration, but all agreed that the minimum amount was a great deal more than a pint a day. The following table, compiled by Dr. E. F. Adolph and his associates, gives the values generally accepted by the end of the war. A team of United States scientists directed by Dr. Adolph went even further and estimated the relationship between total water supply and survival time at various temperatures. Dr. Adolph computed that at environmental temperatures under 70 degrees F., a man who starts out in water balance can survive for ten days. These values apply to an inactive man, in the shade, and with a low calorie intake. Note that the advocates of drinking sea water claim only that a man can survive for six clays by drinking sea water alone and for eleven days if he drinks slightly over one quart of fresh water while drinking sea water. Thus it appears that by drinking no water at all a man would survive for four days longer as he would on sea water, even if the claims of the advocates of sea rater are valid. The data for environmental ternperatures of 70 degrees F. and under are used in the example above because all the sea water experiments recorded have been cared out in temperate and cool climates. As is shown in the table below, expected survival time goes down sharply at higher temperatures, even if the subject can remain in the shade.